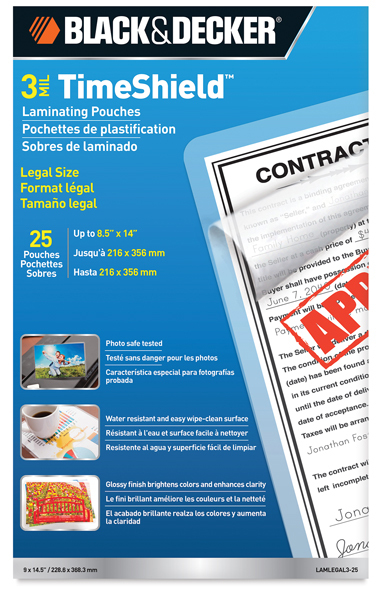 Photo-safe Black & Decker TimeShield Thermal Laminating Pouches have a glossy finish that's guaranteed to enhance clarity. UV protection has been added to the 5 mil size to help ward off the damaging effects of ultraviolet light. The 3 mil size is not UV protected. Choose a number of convenient sizes, all sold in packages of 25. ® Black & Decker is a registered trademark.™ TimeShield is a trademark. 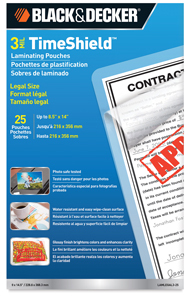 Thermal Laminating Pouches, 3 mil, 8½" × 14"